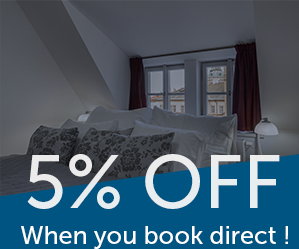 Book your vacation stay in one of 11 aparthotel residences in the very heart of Prague's historical center. All apartments are fully serviced and offer stylish interiors with modern design and high level of comfort and quality. Our friendly staff is ready to help with anything you might need during your stay 24/7. All apartments have Free High-speed Wi-Fi as well as bed linens and high-quality cosmetics for your convenience. All of our apartment residences are located in the very centre of Prague. Live just minutes away from important sights like Old Town Square, The Charles Bridge, or The Prague Castle. Why book your stay with Prague Residences? All reservations made through our website get a 5% discount as well as late check out at 12:00. Just enter promo code at reservation check out. We offer private luxury transfer service from the airport or from the train/bus station to any of our Aparthotel residences. Please book your transfer after completing your apartment reservation. *Find more details on our FAQ page. Our friendly staff is available 24/7 to help with anything you might need during your stay in Prague. Visit them to get tips on best local restaurants, get advice on places to visit and the best way to reach them. All of our vacation apartments for rent have FREE high-speed Wi-Fi and feature modern and attractive furnishings to provide for an unforgettable holiday experience. We've been welcoming guests in the lovely city of Prague since 2008. We only provide the highest standard of services and accommodation in Prague's centre. JUST USE Promo code and get all benefits!